Hey hey! I'm planning a Chinese New Year-themed round-up post once the New Year period is finished (it goes for fifteen days), but for now I wanted to share this Chinese meal that I made for my parents a little while ago, shortly after I got Fuchsia Dunlop's Every Grain of Rice. All the recipes are from this book - which is fantastic, and which I highly recommend! Speaking of Fuchsia Dunlop, I recently tried to get tickets for the Fuchsia Dunlop dinner at Dainty Sichuan, but unfortunately they sold out before I could snaffle them. Boo! Oh well, I'm optimistic that she'll come down again in future! I don't think you quite need four dishes for four people, but I really wanted to try a few different recipes from the book. I actually made this dinner on a weeknight after work - I prepared the red braised pork the night before, and the remaining dishes are reasonably quick to make, as long as you're organised. (Before starting each recipe I measured out all the different sauces/potato flour/spices in little bowls ready to go, and found that this really sped things up). 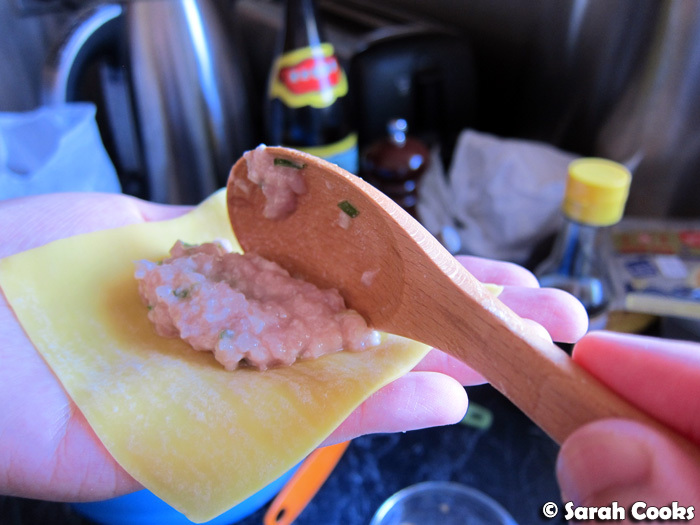 I love tofu, and right now I'm totally into cold silken tofu - delicious! 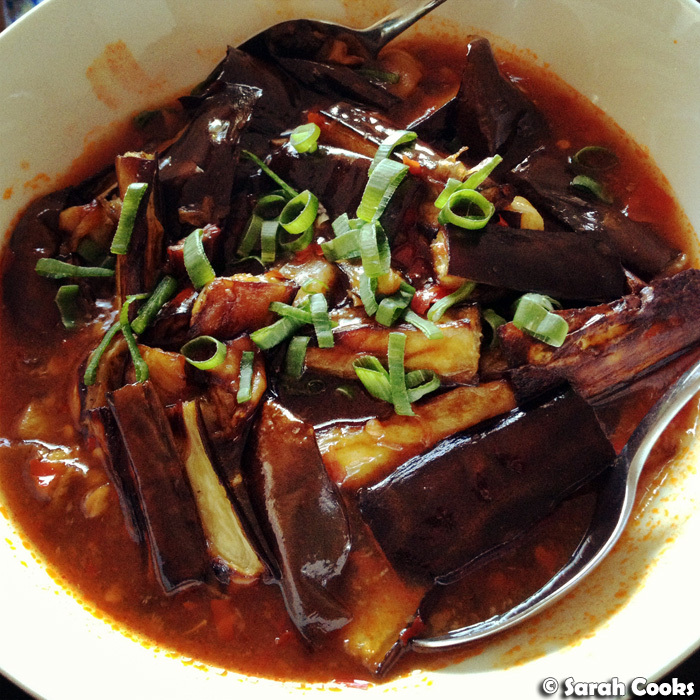 As I mentioned in my "Silken Tofu with Century Egg" post, cold tofu dishes are an easy way to add another dish to a meal without a lot of effort or cleaning up. 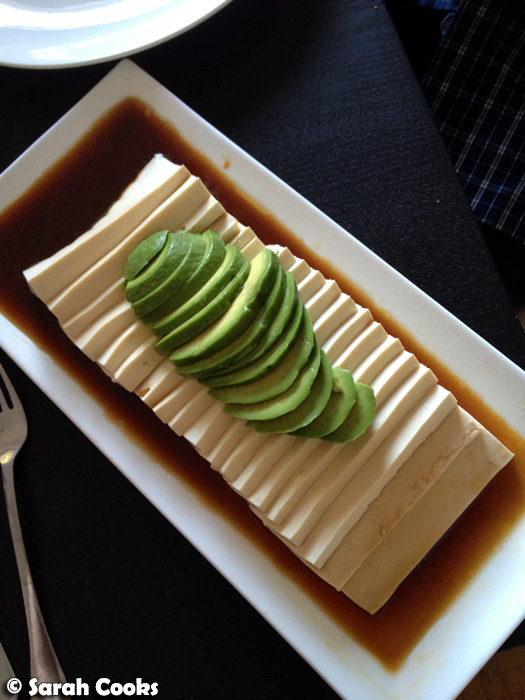 This avocado dish is quite unusual, but we loved the flavour combination. It's quite impressive for something so easy - just slice the tofu and avocado, arrange on a plate and pour a mix of different sauces over. I remember when I first got Every Grain of Rice, this was one of the first recipes to catch my eye - and I was surprised by how easy this was, given how "restauranty" they look. Essentially you're just sitting the cooked pork wontons in a pungent mixture of chilli oil, minced garlic, soy sauce and Chinkiang vinegar. Totally addictive! 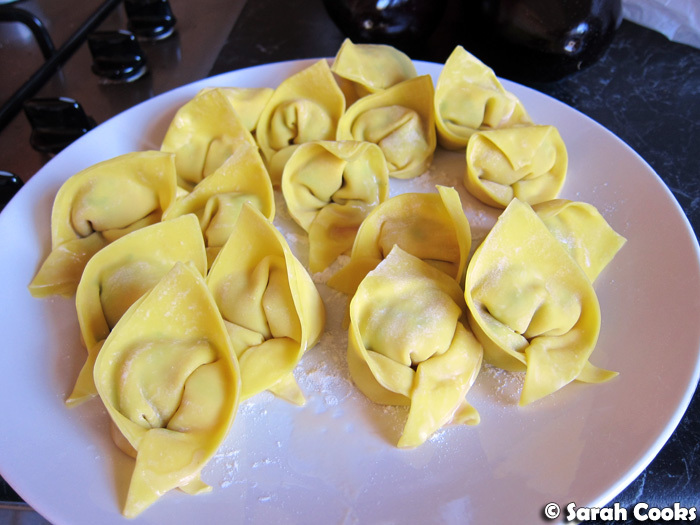 I suppose the hardest part of the whole procedure is folding the wontons, although it's not really difficult, just time-consuming. (Try not to make them too far in advance of boiling them, as the skins soak up the moisture from the filling if left to sit and can easily tear). I followed the instructions in the book to fold them "water caltrop" style, but I guess it doesn't really matter how you fold them, as long as you seal them up properly by moistening the edges and pinching them together - you can't really tell once they're boiled and doused in chilli oil. I chose to make this dish because I knew my dad would love it - with its soy sauce base and spicy aromatics, I thought it would be similar to the tau yuu bak (pork belly braised in soy) that my dad often makes. I was originally going to replace the suggested pork belly with some pork shoulder (more meat, less fat to scrape off! 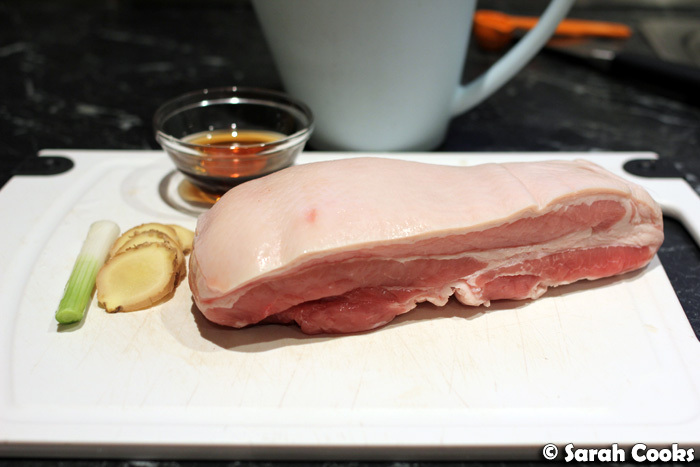 ), but I found this fabulously meaty piece of pork belly at the butcher and thought: "Yes!" So as I said above, I prepared this the night before, allowing it to cook slowly in the oven for a few hours to get really tender. (Not very Chinese, but Fuchsia suggested it and it worked brilliantly). 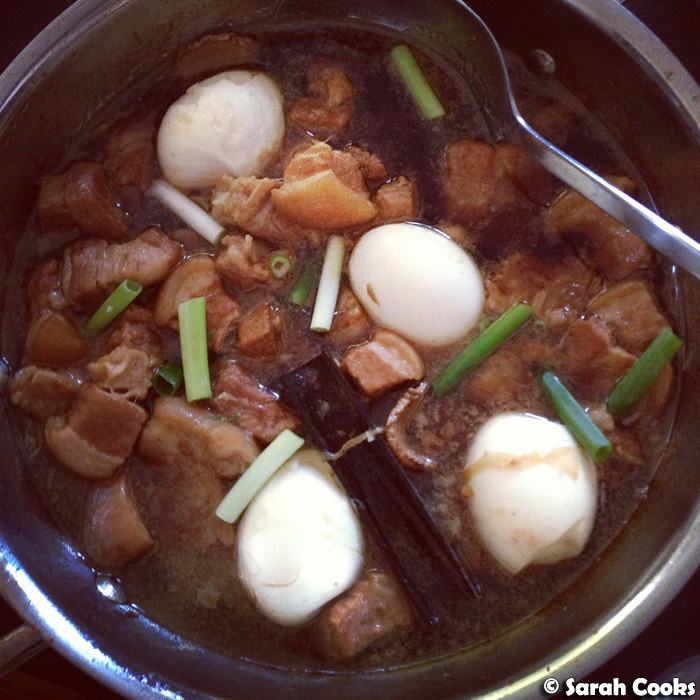 And like when my parents make tau yuu bak, I thought I'd add some hardboiled eggs to the dish, which I cooked and added to the pot the next day. I didn't cook the eggs for long with the pork itself, as I was worried they'd overcook and get tough - hence the pale white colour of the eggs. My mum says you can brush the eggs with dark soy sauce before adding them to the pork, to give them some colour - so I'll try that next time. The dish went down a treat! Tender pork pieces in a rich soy-broth, with the warming hint of cinnamon and star anise - winner winner. 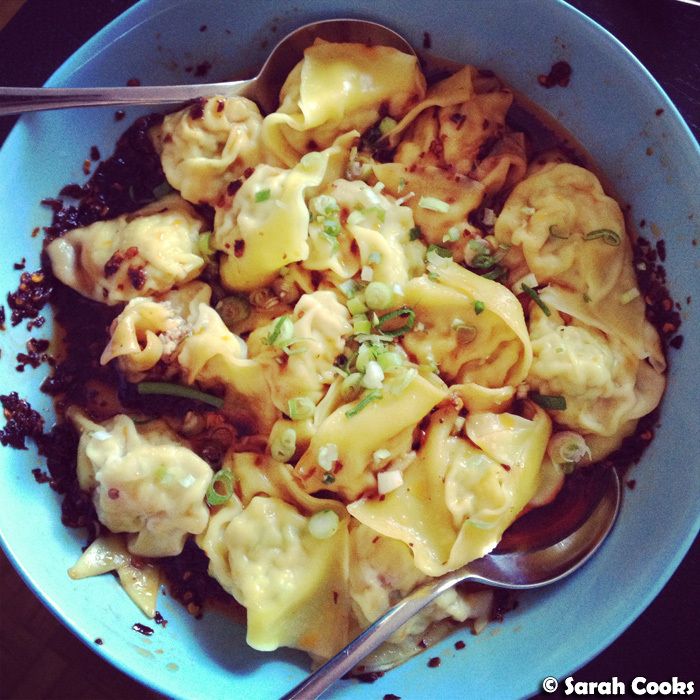 Fab recipes all around, although my favourite has to be the chilli wontons. I loved them so much, in fact, that I'll be making them for our upcoming chap goh meh dinner to celebrate the end of the Chinese New Year period. Stay tuned! I want to try that braised pork dish SO badly!!! !